The grandson of the billionaire creator behind red bull has failed to appear before court again, after being accused of killing a policeman. Vorayuth Yoovidhaya, whose family are worth $20bn faces charges involving the death of a police officer who was killed in a road collision in Thailand almost five years ago, the BBC reports. 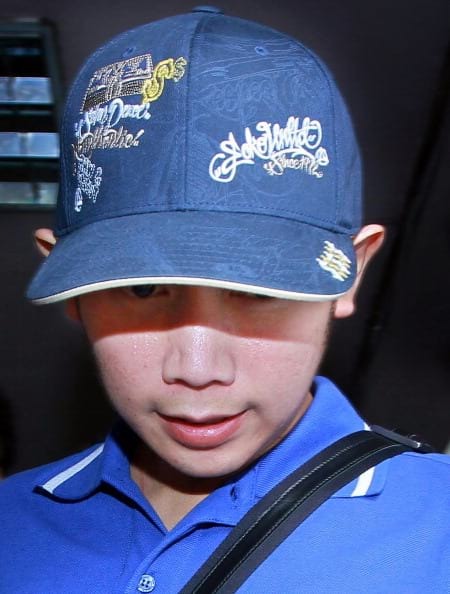 Police officer Sergeant-Major Wichian Klanprasert was knocked off his bike by a Ferrari and his body was dragged 100m down the road, before the driver drove off on 3rd September 2012. 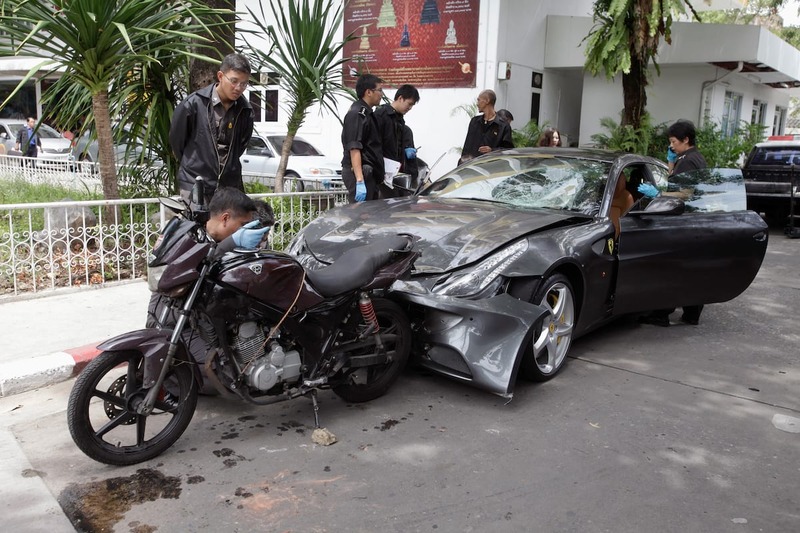 A trail of brake fluid was left behind in the wake of the crash, which lead police to the super luxurious home of one of Thailand’s richest families. 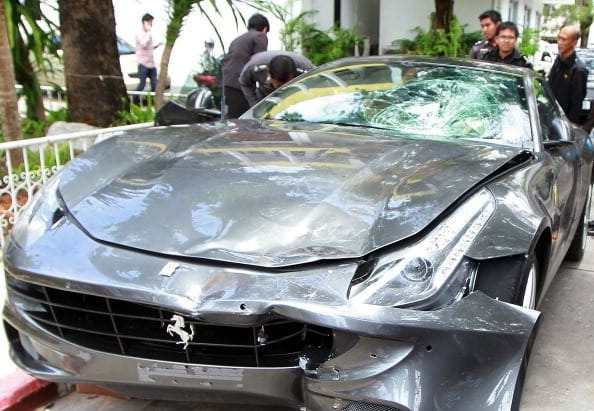 The hugely damaged Ferrari, which belonged to Mr Vorayuth was there, but the police initially arrested the family’s driver as their main suspect. They later found the car had been driven Mr Vorayuth, who was then tested for alcohol levels and found to have excessive alcohol in his blood, which he said was from after the accident had happened. From analysing security camera videos and looking at the distance the Ferrari travelled after the accident and the injuries which killed the policeman instantly, the police believe the car had been speeding at 106mph in an 80km limit. The police then prepared criminal charges of speeding, reckless driving causing death, and fleeing the scene of an accident for Mr Vorayuth. However, the 27-year-old suspect failed to appear in court in regards to the charges, for a total of seven times in 2013, until the speeding charge limitation expired in the September. His lawyers – who denied he had been speeding – offered a variety of explanations as to why Mr Vorayuth had not appeared in court including he was ill or away on business. Initially, police and the attorney-general vowed to bring justice to the deceased policeman’s family, but our years after the charges were brought forward, nothing has happened. In fact, the attorney-general who set about to indict Mr Vorayuth, was forced to retreat after his lawyers campaigned against the speeding charges. The police were then ordered to arrest Mr Vorayuth after he failed to show up in court for the seventh time, but it didn’t happen and the case fell into obscurity. For three years, the case seemed to be forgotten about and Mr Vorayuth disappeared out of the public eye and embarked on world travels, sunning himself on the beach and visiting car racing competitions. Now it seems the case has resurfaced after another rich man ran his speeding car into another and killed two people, prompting people to wonder what happened to the case involving the Red Bull heir. After years of corrupt governments running the show, the new military government were keen to be seen to be doing something. Last year, the Attorney-General aimed to press charges against Mr Vorayuth once more, but yet again his lawyers blocked him from attending court. Thai lawyers told the BBC, it is not legally justifiable for Mr Vorayuth’s legal team to prevent him from appearing before court, yet police say they are powerless to do anything. It seems, the police, the Attorney General and their suspect are all at loggerheads, as the police have passed the buck saying the Attorney-General needs to act, but he says this cannot happen until Mr Vorayuth makes an appearance. The family of the policeman killed in the crash have not spoken out about the case, which is apparently fairly common in these controversial cases. However, it has been reported Mr Vorayuth’s family paid his family $100,000 so they would not press charges themselves. Sadly, it appears, Mr Vorayuth will get away with never appearing before court, as the most serious allegation against him involving reckless driving causing death expires in 2027. Very few people in Thailand believe his lavish lifestyle will suffer as a consequence of the charges against him or that he will face any legal repercussions at all. A lawyer who was once involved in the case told the BBC he had never experienced a suspect managing to escape justice, quite like this and claimed if it had been someone else from a less powerful family, he would have been arrested the first time he evaded court. Unfortunately, the Thailand government is full of widespread corruption, which means the rich can essentially do what they want without the consequences of the law others would suffer. Mr Vorayuth has evaded court for the eighth time and the court has postponed the hearing once more. Hopefully justice will one day be brought for the policeman who sadly lost his life in the atrocious collision.